Since then, however, Google has announced they're getting rid of iGoogle altogether and I went out in search of something new to replace it. 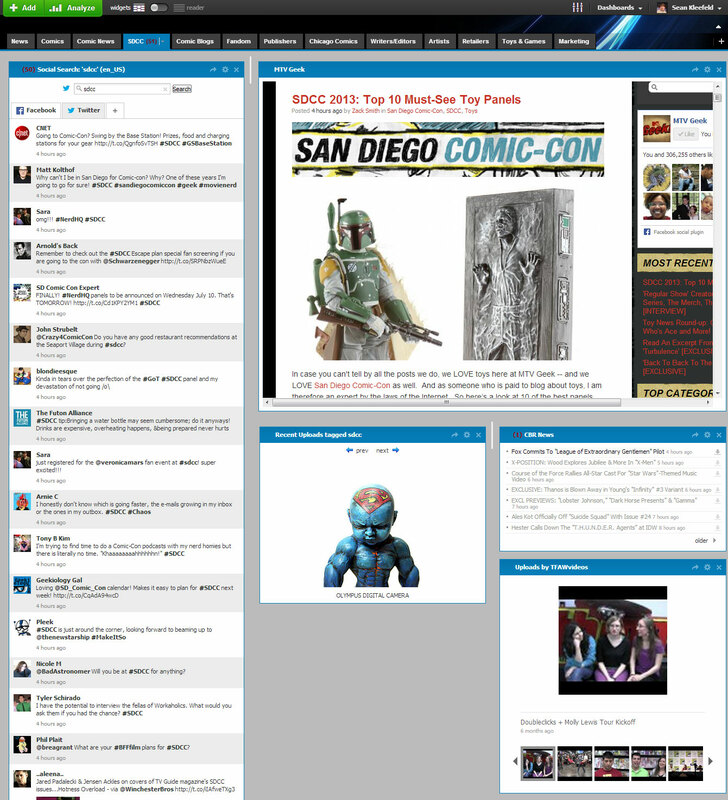 Technically, iGoogle is still around and you could continue to use it for this SDCC, but I wanted to make sure I had plenty of time to adjust to a new environment, so I've been using NetVibes for several months now. (I think since December?) The concept is the same, but they don't have quite as many widgets, and the ones they do have haven't been tested as rigorously. 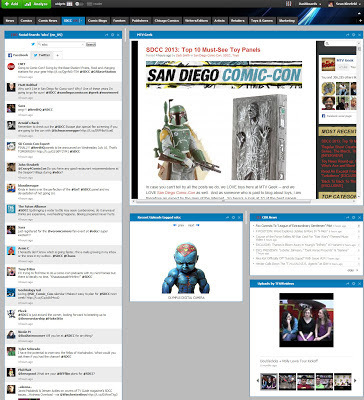 On the left is a Twitter feed pulling in everything with "SDCC" tagged to it. Twitter evidently changed their API recently, and the NetVibes widget now requires you to connect with your signed-in Twitter account for it to work, but it does seem to work well. On the right is an iframe pulling in MTV Geek's con coverage. It's just pulling in the whole site, but I did link the iframe specifically to an ID tag buried in the code that happens to be near where the content starts, so I can skip the top navigation stuff which I wouldn't use here anyway. Under that is a Flickr widget pulling in a slideshow of any images tagged SDCC. The CBR and TFAW pieces are just pulling in the RSS feeds of Comic Book Resources new, and Things From Another World's YouTube channel. CBR con coverage tends to dominate their news feed for the week, so there's no need to split anything out, and TFAW seems to be the most consistent YouTube user for uploads from the show. Two years ago, they had not-quite-live reporting and last year they posted videos of several panels in full. In the past, G4 and Marvel also had video coverage. With the recent change-ups at G4, I'm not sure if that will continue -- I don't see any notices on their site about con coverage for this year. Marvel has traditionally not posted anything on their site to tap into until much closer to the show. ComicsAlliance used to have a "conventions" RSS feed that I pulled as well, but that seems to have been lost in their leaving the AOL umbrella. The past few years, this type of set-up has served me very well, and I felt like I had some level of particpation at the event, even though I wasn't even near that coast. We'll see if I can snag some other sources of information as we get closer to the show, and I expect I'll spend a lot of time staring at computer monitors that weekend. It's not the full-on comic convention experience but for the chaos that is SDCC, I'm happy with my set-up here at home.